For the past few weeks I have been talking about what I want to make for my birthday breakfast. To me, my birthday is just any other day, except I had a little more fun with my food. I had been bouncing the idea around of making frittatas because 1. I love eggs 2. I need an excuse to use my mini baking pans and 3. I had feta in the house and I wanted to be creative with it. I decided that I needed to definitely incorporate the feta into my frittata, I wanted it to be a leaner frittata – so heavy use on egg whites and somehow bacon needed to be on my plate, whether in or out of the frittata. 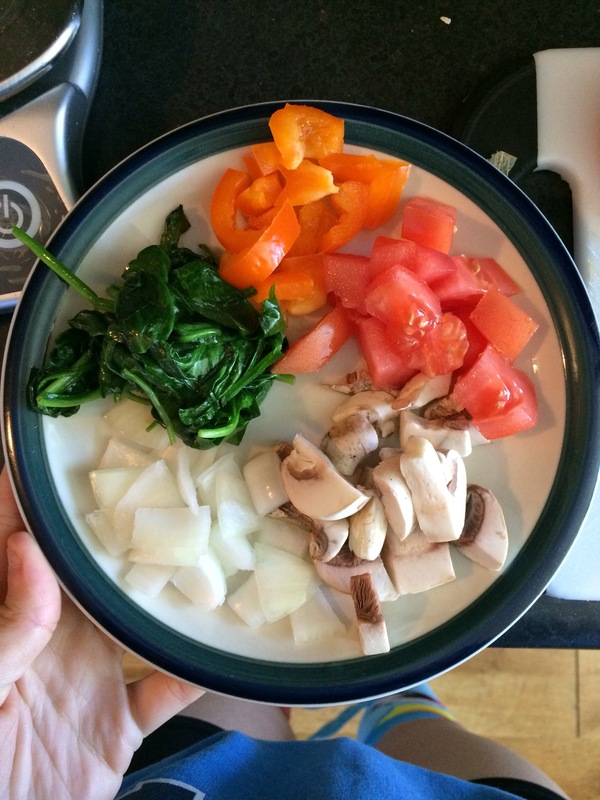 Since my boyfriend is home for the week I thought this was a great time to experiment and get his opinion – he even helped chop and weigh out the veggies! Below is the recipe I used to make mine. Keep in mind your add ins can be 100% optional and therefore will change your macros for your meal. Chop up your veggies and other adds as necessary. I picked these amounts for my veggies based on what I had in the fridge and the volume I wanted for the pan I was using. Measure out your egg whites and add to a bowl. Crack 1 whole egg into the bowl and beat with a fork until blended. Slowly add veggies to your egg bowl. I added mine one veggie at a time so I could blend them in and prevent splash of egg on the counter. 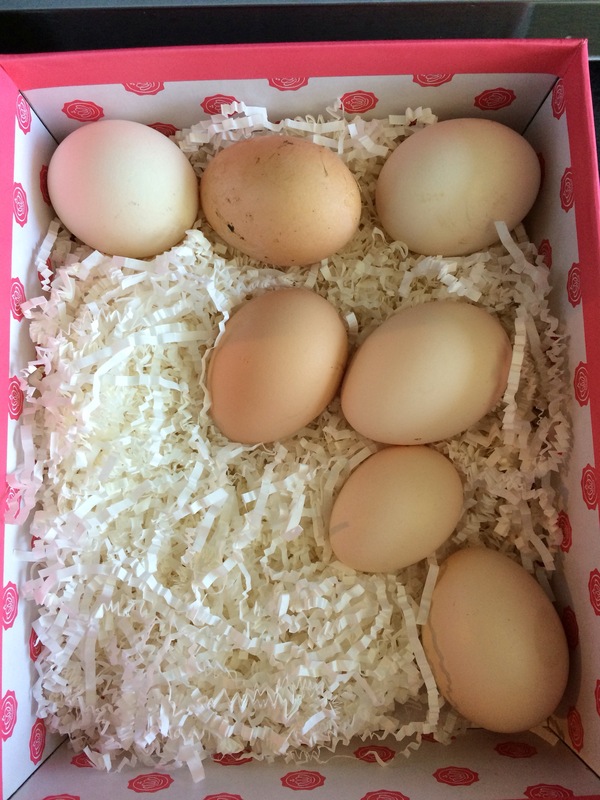 My friend gave me fresh eggs from her chickens! 5. Spray your baking dish with cooking spray so that it’s covered. If you don’t use enough the veggies that are in your egg mixture will stick and the whole frittata won’t come out of the pan easily. 6. 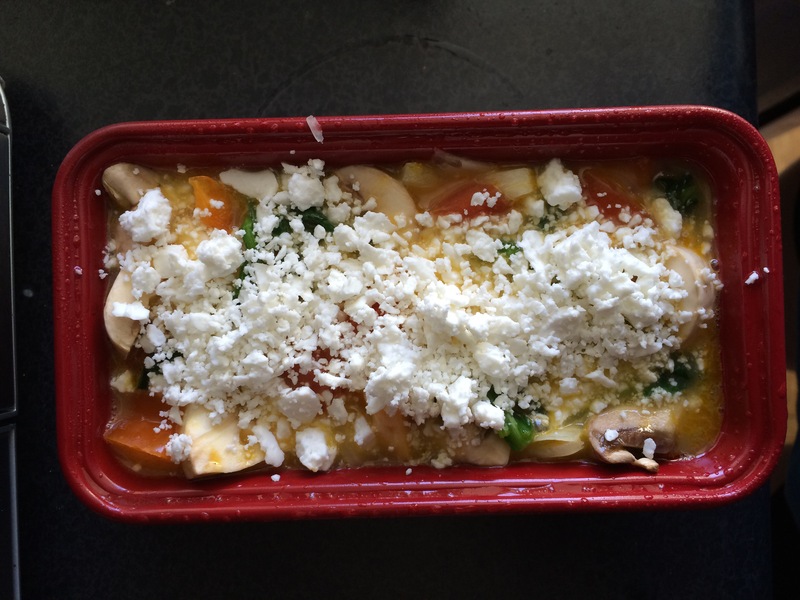 After your veggies are mixed well, pour your egg mixtured into the baking dish. I took a fork and moved some of the veggies around so that they were a little more even in the throughout the frittata. 7. I decided to not mix the feta into the frittata, but to add it on top. If you don’t like feta, you can use any other cheese you do like. I would suggest something shredded so that it melts evenly. 8. Bake frittata for about 15 minutes. To check, poke it with a fork and see if it comes out clean. I tried to poke mine where there wasn’t cheese so I could get a cleaner reading. Depending on your oven, it may take more or less time. 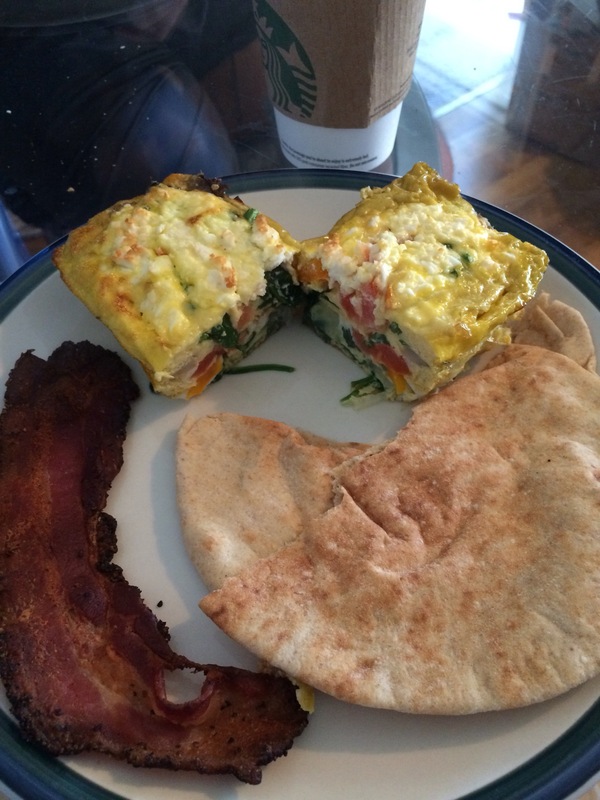 I paired my frittata with a flax and oat pita and a slice of peppered bacon because it’s my birthday and I wanted bacon. One slice won’t hurt, half a pound may not be a good decision. This was a lot easier than I thought it would be to throw together and the egg whites held really well. My concern was that many frittatas use whole eggs and even quiches uses milk and/or cream cheese to make them fluffy and for binding. I thought this fluffed up a lot and held together perfectly – no complaints at all! I think we’ve gone over that I love food and I think it should be fun. Breakfast is one of my favorite meals of the day and I’m glad that I had the chance to try something new. It was also nice that my boyfriend was home and I could have him try it too. I hope you have a chance to try this and even make your own variation with different veggies and mix ins. 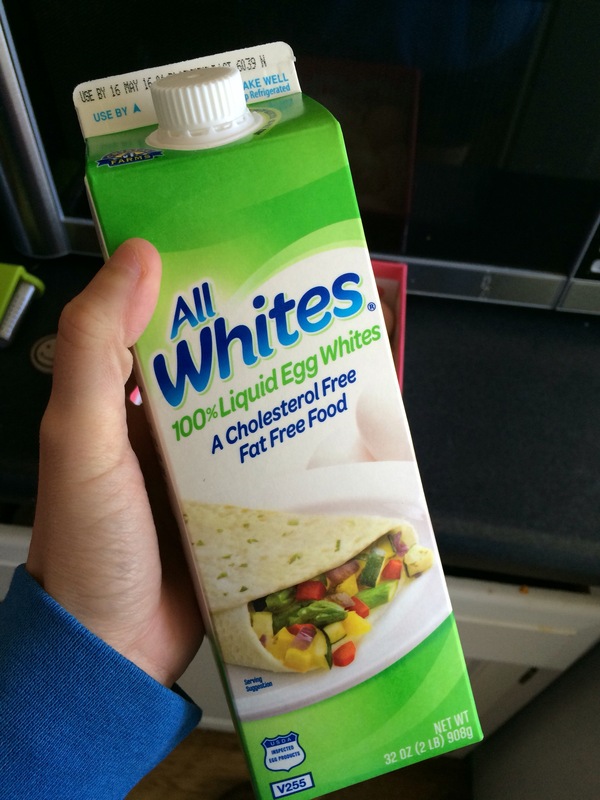 There is so much potential with eggs and especially with something like this!